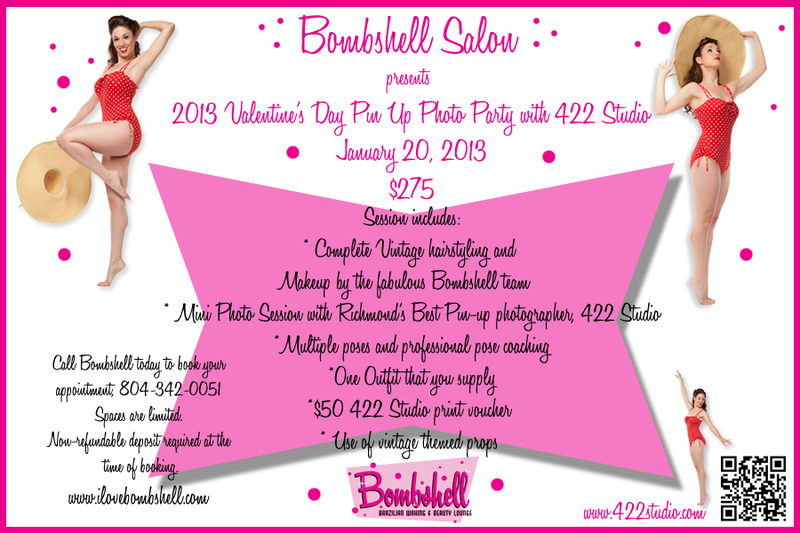 We are teaming up with the lovely ladies of Bombshell Salon in Richmond, VA again this year for a client appreciation Pin Up party. They'll be supplying the styling and I'll be taking classic Pin Up style photo's. Be sure to contact Bombshell in Carytown to schedule your pampering pin up session. The Carytown store number is 804-342-0051. Can't make it in to Bombshell for this event but still want pictures in time for Valentines Day? Just contact Ginger to set up a private, in studio, session. ginger@422studio.com or call 804-833-0888. You can also visit the website at www.422studio.com to see samples and contact me right through the page.